“Join Affiliate” ThemeHunk allow you to sell our themes on your website. 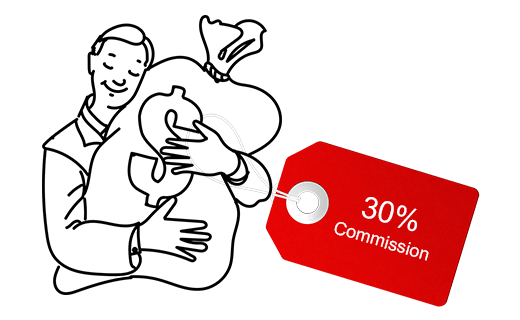 You can easily join our affiliate program and start selling our themes and get paid 30% commission on each sale. It is easy to join our affiliate program, Just fill the form given below and you will receive a confirmation email on your mail id, by clicking on it you can activate your account and start selling theme. 2. Is there any limit for selling theme. No there is no limit for selling themes. You can sell unlimited themes, more you sell more commission you will get. 3. When do i receive my payments. You will receive payments in first week of each month. Before getting payment your commission must reach $100. Once you will reach $100 we would pay you. 4. How does this program works. Our programs allows you to make money by referring our theme to customers. You can place links banners and images to sell them. And once a theme is purchased with your link, then it will be tracked by our program and your earning will added to your account. 5. Does you take any charges to become affiliate. Joining our affiliate program is completely free. We don’t take any charges from you. Complete our registration process and start your business. 6. Can i promote your themes on more than one websites. Yes you can promote our themes on more than one websites. 7. What resources will i get after joining affiliate program. – You cannot use our companies name “ThemeHunk” to promote theme. because it will conflict brand name.